Sleepy Hollow International Film Festival (SHIFF) is honored to announce the addition of Jeffrey Combs’ acclaimed, live one-man Edgar Allan Poe show, NEVERMORE, as one of the festival’s major events at the historic Tarrytown Music Hall in Tarrytown, New York. The performance will be featured at the festival, which takes place October 10-13, 2019. Check www.sleepyhollowfilmfest.com and the Tarrytown Music Hall for forthcoming information on NEVERMORE’s showtime and date as it becomes available. 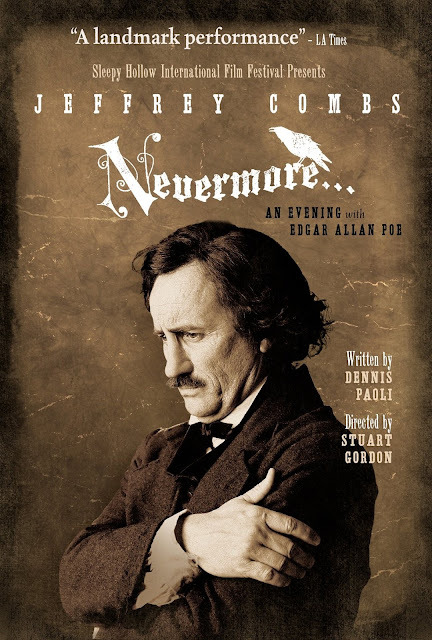 Directed by Stuart Gordon, written by Dennis Paoli and starring Jeffrey Combs, NEVERMORE is a critically heralded experience that has delighted audiences for more than a decade. Hailed as “a landmark performance” by the L.A. Times, Combs has thrilled crowds across the country with his dynamic and revelatory portrayal of the legendary Poe. SHIFF, a celebration of outstanding genre cinema in the cradle of the American supernatural, takes place in Sleepy Hollow and Tarrytown, NY, October 10-13, 2019, and features an exciting line up of film premieres, special screenings and live events.